Part 1 Case studies: The trade union researcher: Sandeep; The further education lecturer: Peter; The voluntary organisation: Wendy; The academic: Sandra; The media consultant: Jeremy; An international student: Olaf; The Cochrane Library: Jo and Ioannis; The legal viewpoint: Annabel; Educational usage of economics and management resources in France; Finding and managing information for the international community: Barbara; From practice to need – some reflections. Part 2 The information issues: Effective online information services management; Selection; Marketing your service; Usability; Making your resource more accessible; Legal issues; Building user skills; Subject classification; Metadata; Technology. Part 3 The information issues: Social horizons; Technological horizons; From need to service: the changing role of the information professional. Information professionals are increasingly responsible not only for running traditional information and library services but also for providing an online presence for their organisation. 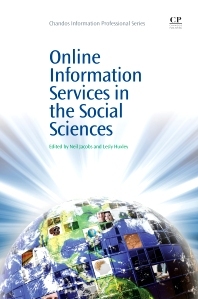 This book shows how best practice in delivering online information services should be based on actual user needs and behaviour. A series of case studies provide real life examples of how social science information is being used in the community. The book then draws on these case studies to outline the main issues facing service providers: such as usability, metadata and management. The book concludes with a look to the future and how both technological and organisational changes will shape online information services. Dr Neil Jacobs, an experienced information professional who has worked both in traditional libraries and on national projects and online services and works at the Joint Information Systems Committee (JISC) and University of Bristol, UK and is responsible for developing and running national online services. Lesly Huxley is based at the Institute for Learning and Research Technology, University of Bristol, UK and is responsible for developing and running national online services.